Going hard on the incense, eh, Mike? 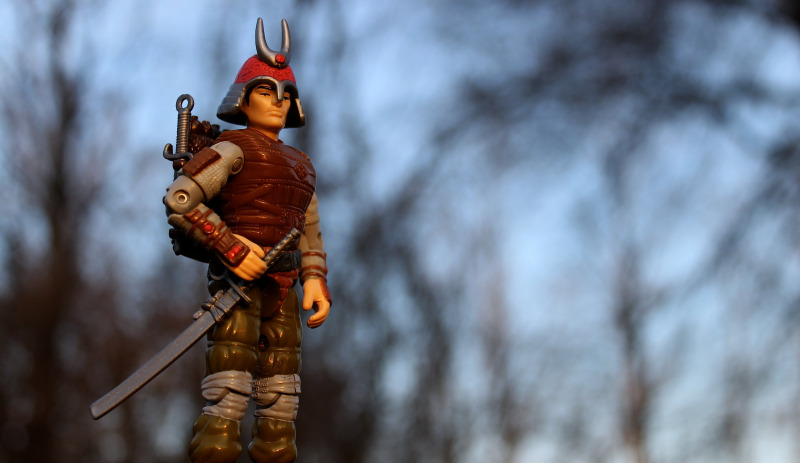 I recently got a Funskool Budo and really like him. He's not the most military figure, but he's really well done and cool looking. I always had a soft spot for him, but after actually owning him, I like him even more. FANTASTIC photo. He looks noble and contemplative, as he should. Budo's a very nice figure, though perhaps he's not a great G.I. Joe figure. I never figured out why Hasbro didn't use the G.I. Joe construction and scale on other toy lines. Another thing about Budo is that he and Shockwave both really suffer from the "SOLID COLOR TORSO" that was so popular in 1988. Ironically, he's the ONLY figure I did get from '88. He's definitely a weird Joe. I've never bothered seeking out a complete figure, but at some point I might. I think he's the kind of figure that's a lot less cool if you don't have his parts. Back in college, I somehow managed to find two Budo figures. (Didn't have them as a kid.) I had them guarding a metal "incense" temple that I had. Both of them got pretty badly discolored from it, too.